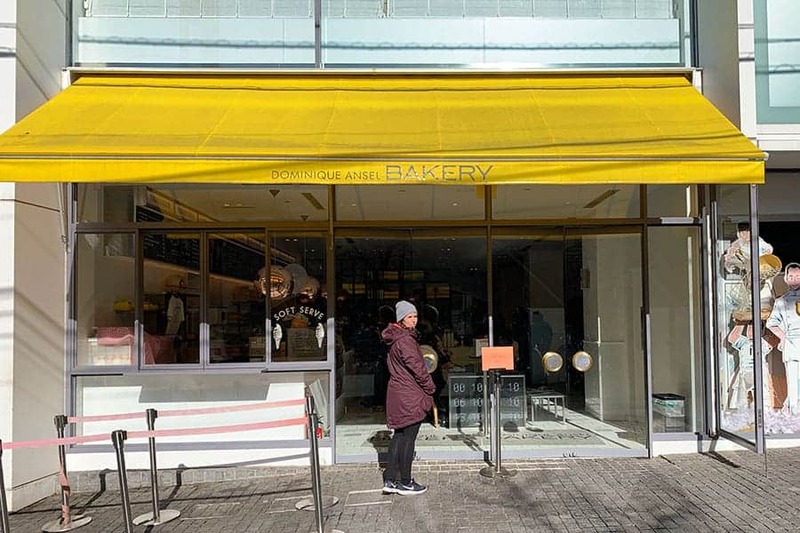 If you only have 48 hours in Japan and you love food, be sure to check out a few of my top recommendations for dinners and desserts in Tokyo. Our honeymoon feels like it was ages ago, and after planning and look forward to that trip for over a year, it was surreal when it was actually happening. Even as we got on the plane, it didn’t seem like we were going to Japan! We had planned Japan as our honeymoon destination because one of our favorite things to do together is to snowboard, so while that was the main focus on our trip, we wanted to be sure to pack in as much as we could during our time in Japan. 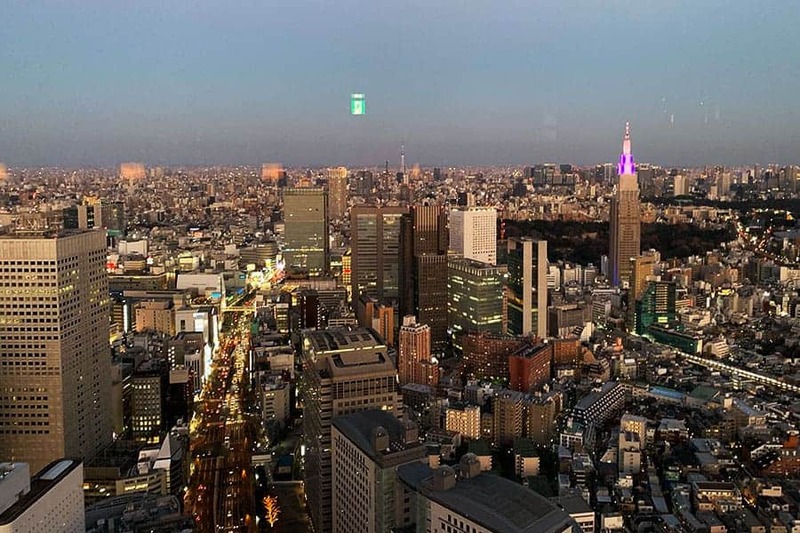 We spent 2 full days in Tokyo before traveling to Niseko to allow ourselves to adjust to the time change but also to get a little taste of what Tokyo has to offer. We stayed at the Hilton in Shinjuku. It’s about a 15-minute walk to the train station, which was very doable, but also the bus from the airport stopped at hotel, so it made it very easy to transfer to and from the airport. My husband and I have both traveled quite a bit to Asia for work, but this was our first time in Japan, and our first true international trip together- Canada doesn’t count. 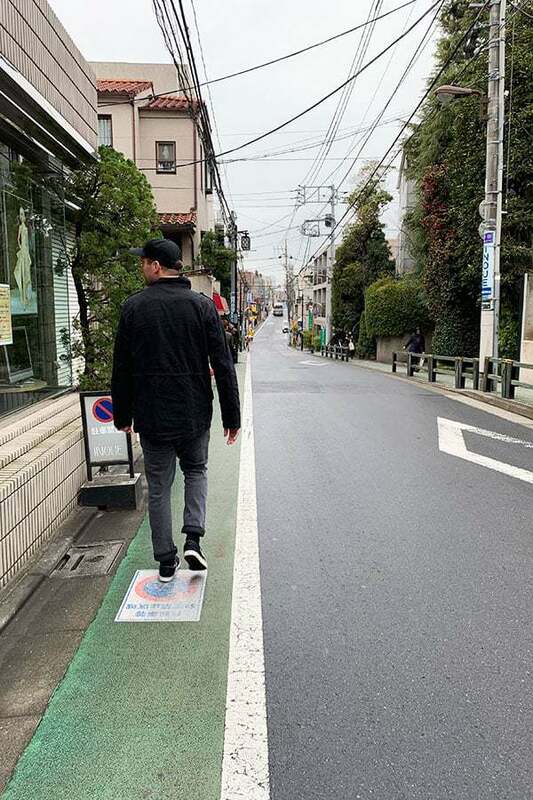 We didn’t have much of a plan for Tokyo other than a few destinations or stores we wanted to see. We received so many recommendations and suggestions that it was actually quite over whelming to decide what to do with our two days. I recommend putting together a Goggle map with your intended destinations. Once we had that we could see how close or far away the different areas were. 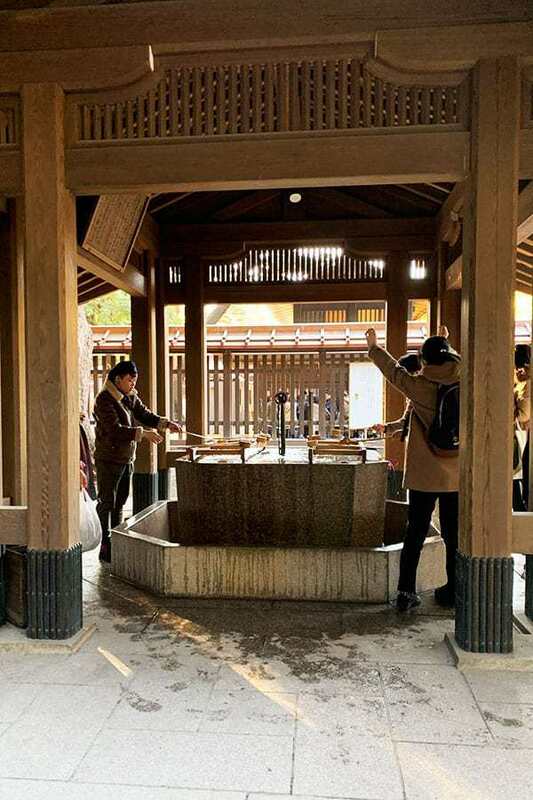 Also pay attention to the business hours on the weekends, as some places are closed. Be sure to plan ahead and order a pocket wifi from Japan Wireless, pick it up in the airport when you arrive. It was a life saver! I didn’t have to turn on my phone service once, and we could text and use Goggle maps the whole trip. Charge it every night and you’re good to go! 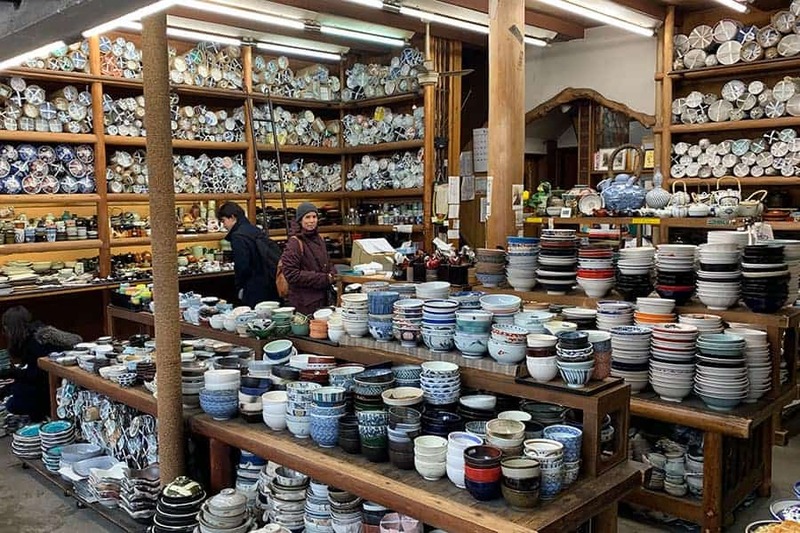 Our first destination was “Kitchen town” aka Kappabashi Street, a well-known street for their endless restaurant supply stores including everything from beautiful dishware to industrial size cooking equipment. We weaved in and out of the tiny shops looking for a couple of pieces to bring home. I had to resist buying ALL THE THINGS because I didn’t have a ton of space in my luggage. We took a taxi from our hotel which ended up being around $50 for the 25 minutes ride. 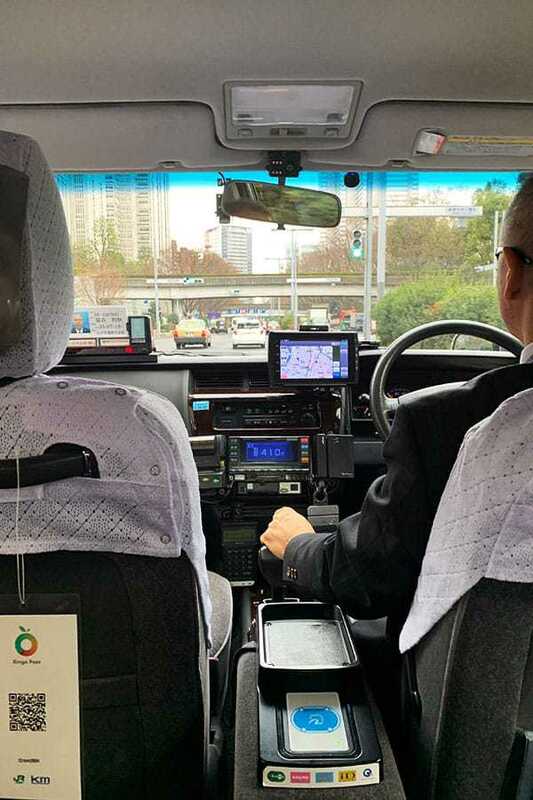 Taxis are very expensive, but we wanted to get our bearing a little bit before jumping on the subway. Plus it’s a nice way to see some of the city since we arrived at night. Turns out the subway systems are quite easy to use, and they are very clean and very affordable. 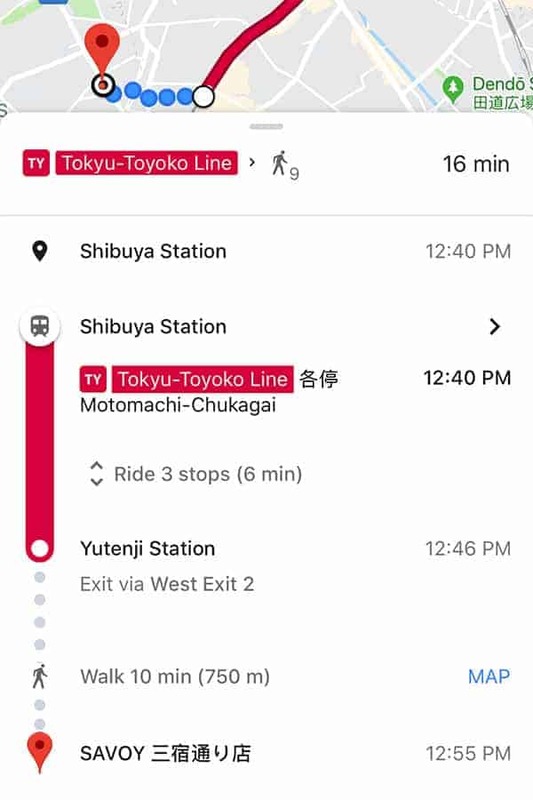 Just use your Goggle maps app and it will tell you the trains you need and the how many stops you take to get there. The hardest part was navigating some of the larger train stations, but there are attendants who can point you in the right direction. 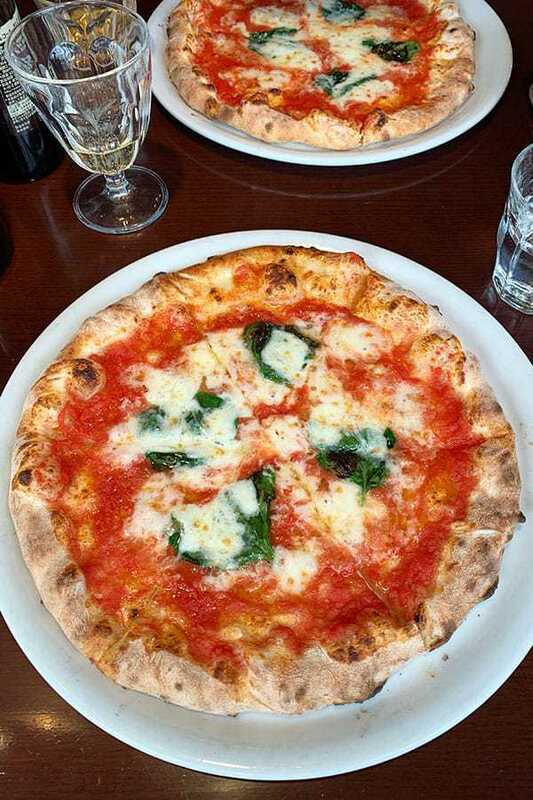 Next, we headed to Savoy, an Italian restaurant specializing in Neapolitan pizza, a favorite of ours! 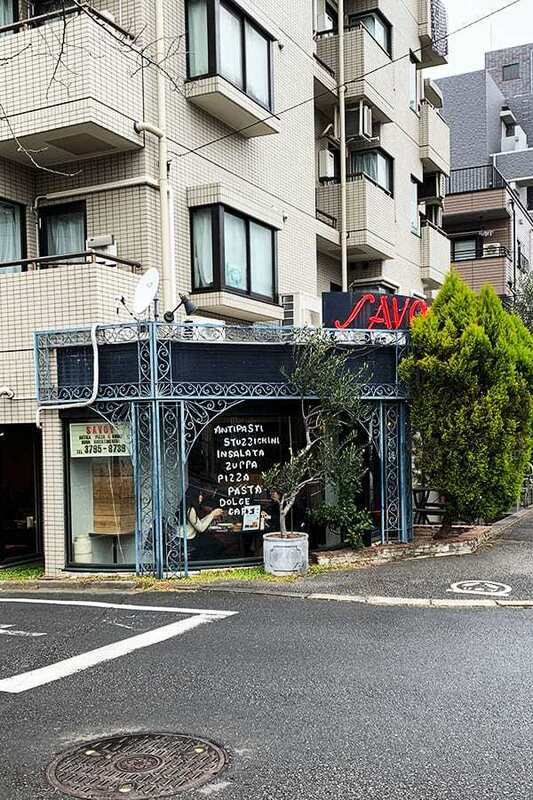 It might seem silly to eat pizza in Japan, but this place was on the Netflix show “Ugly Delicious” and we’ve received multiple recommendations to go there, so it was a must-visit. They have two locations, and the one we went to was more of a sit-down restaurant, only about a 10-minute walk from the train station in the cutest, quietest neighborhood. The other location is much smaller and I believe standing room only, or very few seats, so I imagine the wait could be quite long. It was beyond satisfying, not only because we were super hungry, but sipping on champagne and eating pizza in Japan sounded was a dream to me. Don’t worry, I ate the whole pizza to myself. 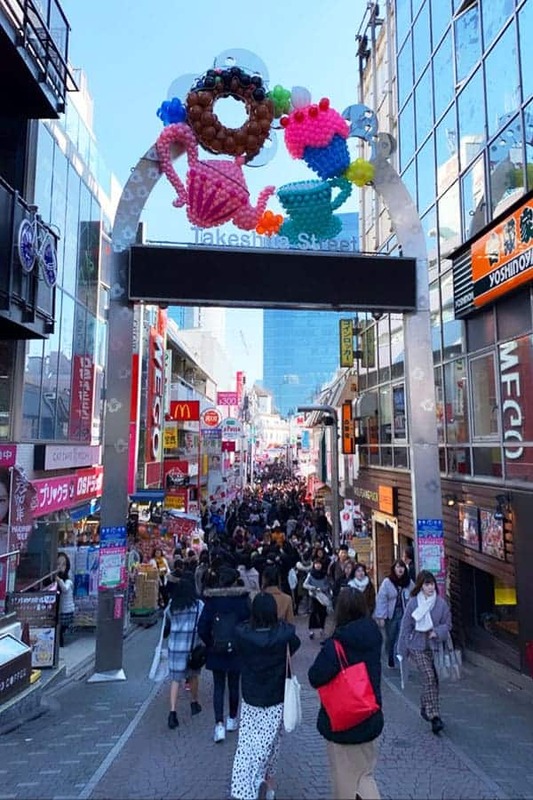 That afternoon we headed to the Shibuya neighborhood for shopping! 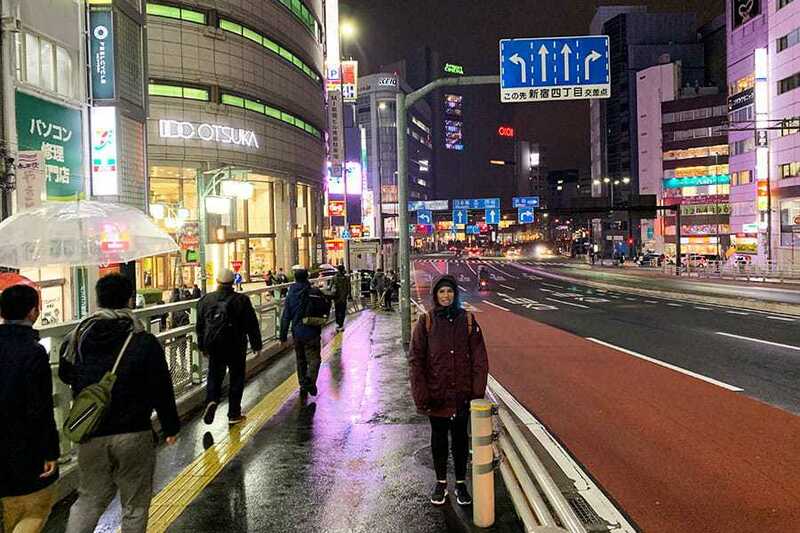 We went to Shibuya with no real plan other than to see a visit a few stores. You can find everything from souvenir shops to Chanel, but it was also full of streetwear brands, which is more up our alley. Shibuya can feel a little overwhelming. It’s a very popular tourist destination, and so it’s packed with people, but once you get off some of the main streets, it’s much calmer. Shibuya crossing is the famous cross walk where hundreds of thousands of people cross everyday from all different directions. Yes, we did stop at the Starbucks overlooking the crossing so we could see it from above. Just a tip, skip the Starbucks line and walk around back to the stairs through the electronics store. Starbucks is super busy, so we did not sit down, but found an open spot to snap a few pictures and got right outta there! We spent the afternoon weaving in and out of shops and back alleys, I just loved seeing all the tiny streets and storefronts. It was amazingly quite once you got off the main roads and I was just in awe of how unique and different the areas were. 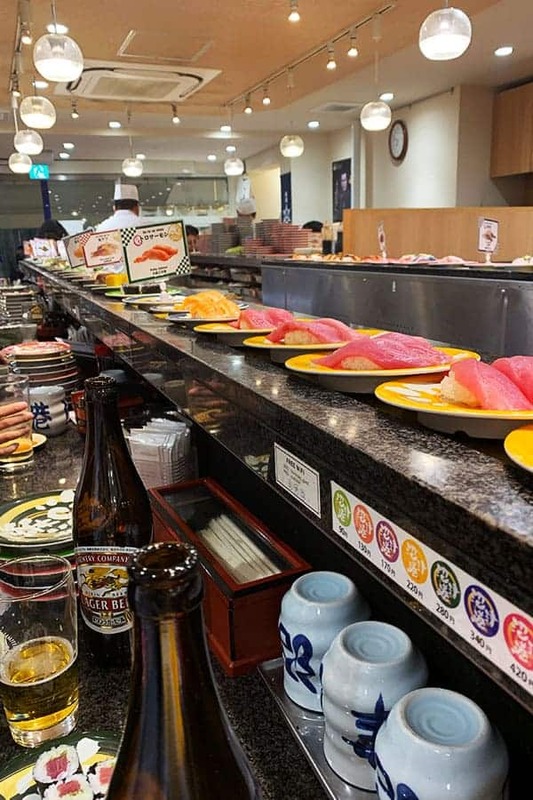 That evening we headed for some conveyor belt sushi , which was a requirement for our trip. 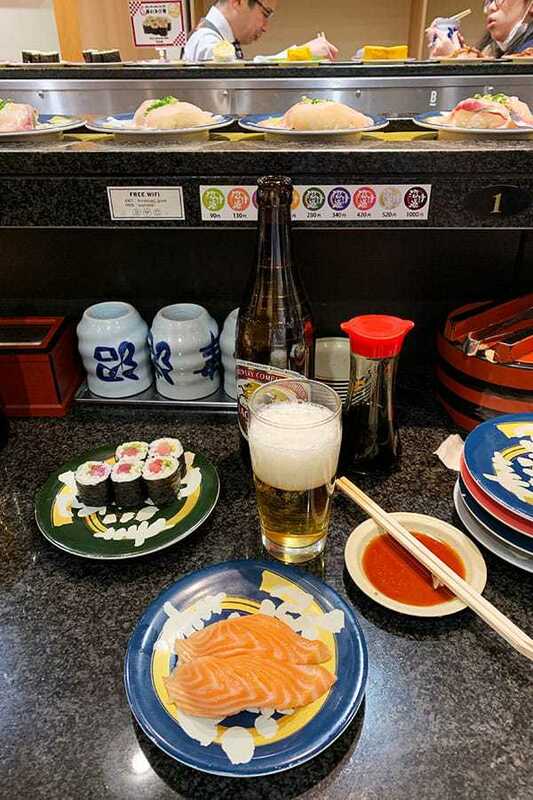 We had heard great things about conveyor belt sushi. It’s very affordable but also very good sushi. I am not the most adventurous sushi eater but we did really well. We went early, around 5pm so we didn’t have to wait in a long line. When we sat down, no one really explained to us how it worked, so we waited a few minutes and then just started grabbing plates. At this location you could either order from a server or pull down the plates you wanted. 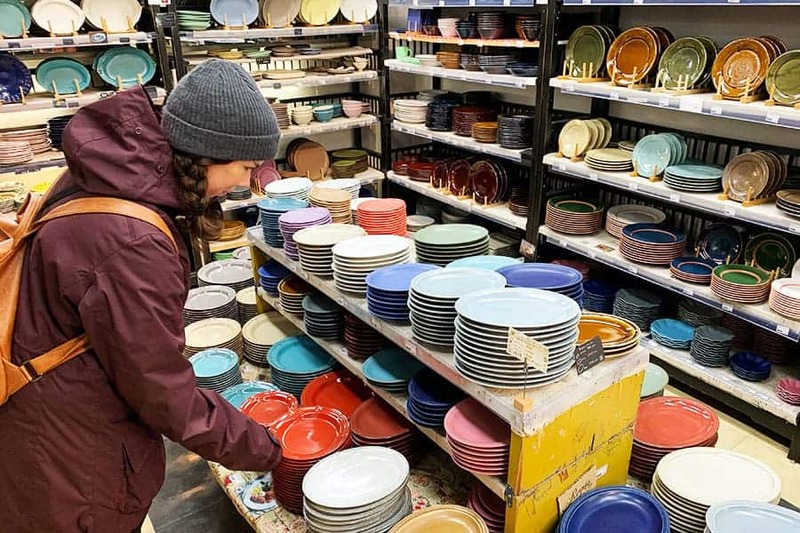 Each plate is priced based on the color. It was a very cool experience and I would highly recommend it! After a solid nights sleep, we headed out for day two of shopping and neighborhood exploring Harajuku. 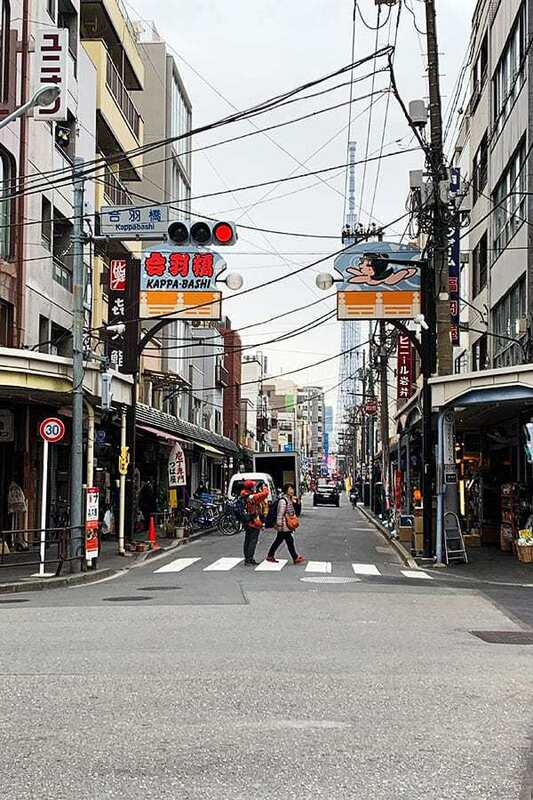 It started with a quick walk through Takeshita Street. 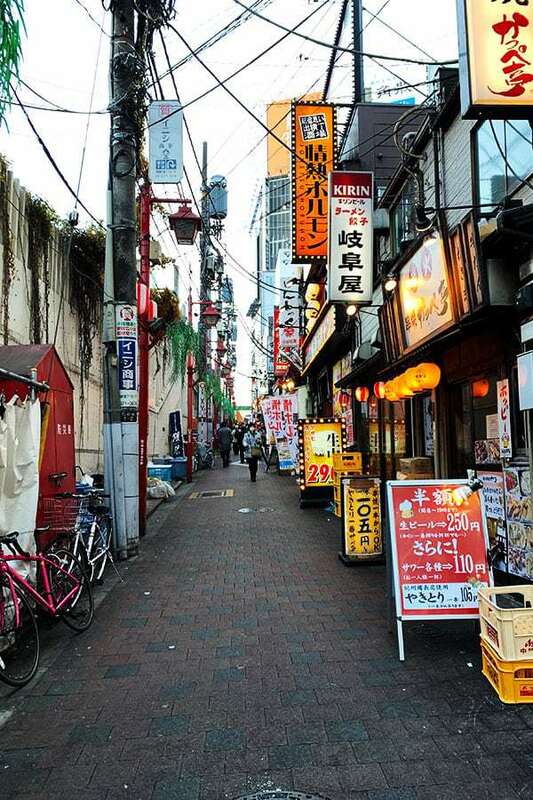 This is another popular (and crowded) neighborhood known for its over the top street food and gift shops. 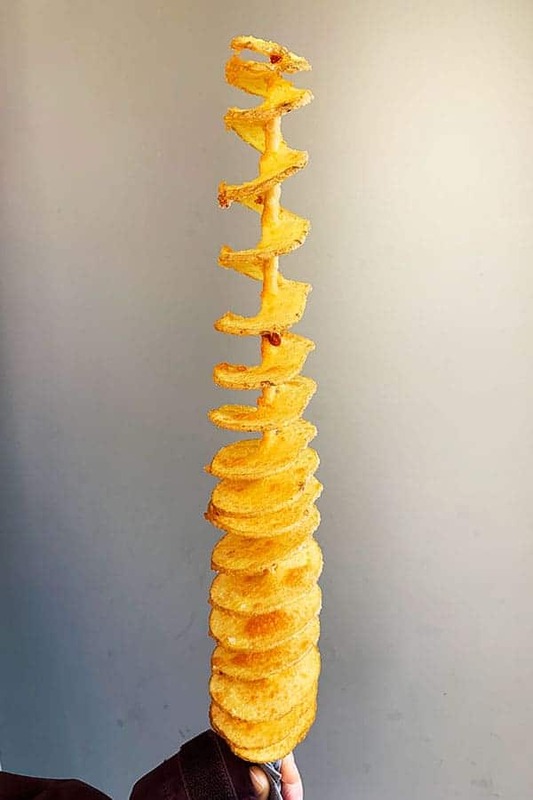 We didn’t go too crazy, as it was early in the day, but I stopped at Cookie Time and the spiralized potato shop. As much as I wanted to get some beautiful cotton candy from Totti Candy Factory, I knew I couldn’t eat the whole thing, so I just snapped a picture instead. Seriously, you could go crazy with all the different street foods here. Bring a friend and your stretchy pants. Again, we spent the afternoon weaving in and out of different stores, taking in all the beauty of the different neighborhoods and found ourselves at Dominique Ansel Bakery. 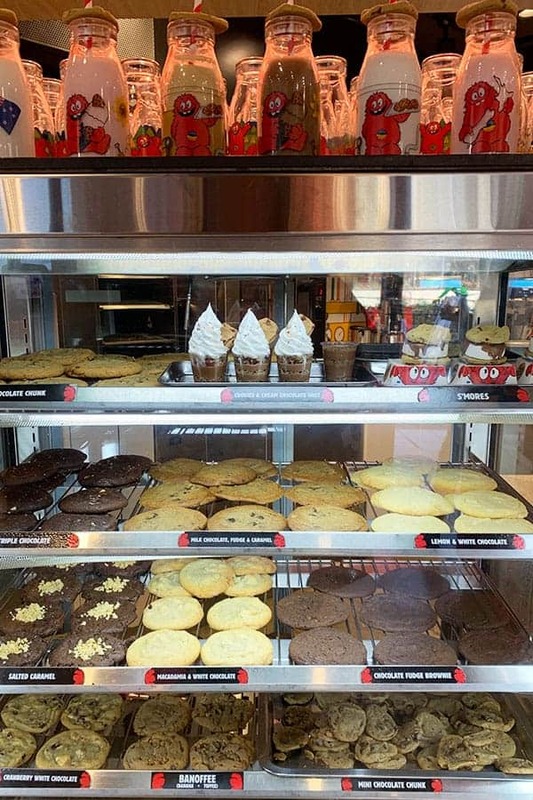 This bakery came up in multiple searches when I was looking for dessert spots to explore. It did not disappoint. 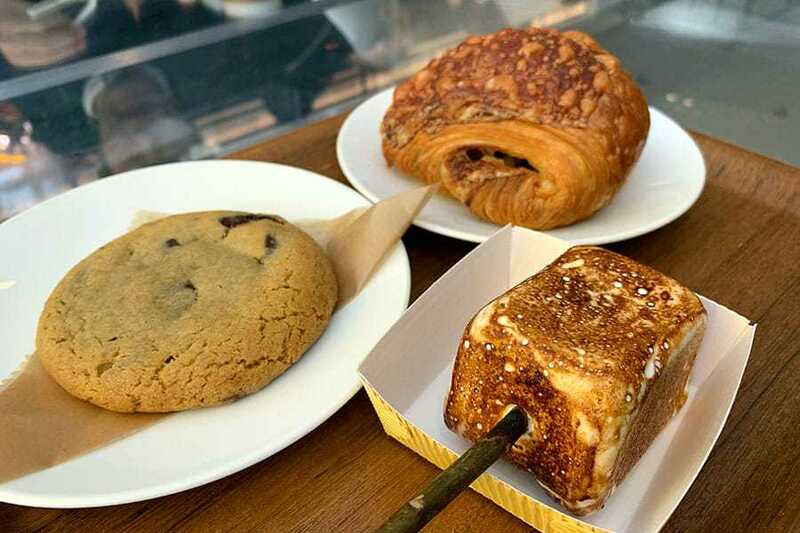 We ordered a ham and cheese croissant, a chocolate chip cookie and a frozen smore. The frozen smore was so cool! 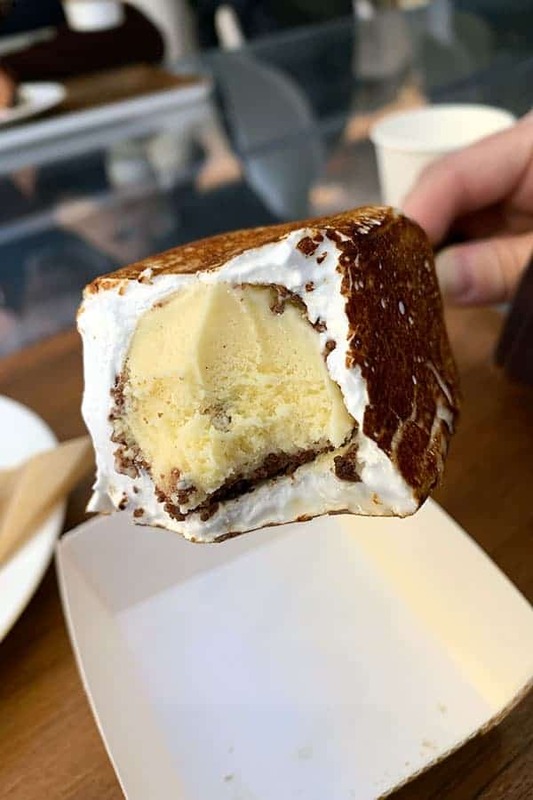 It was vanilla ice cream coated in chocolate and then dipped in marshmallow and toasted to order. 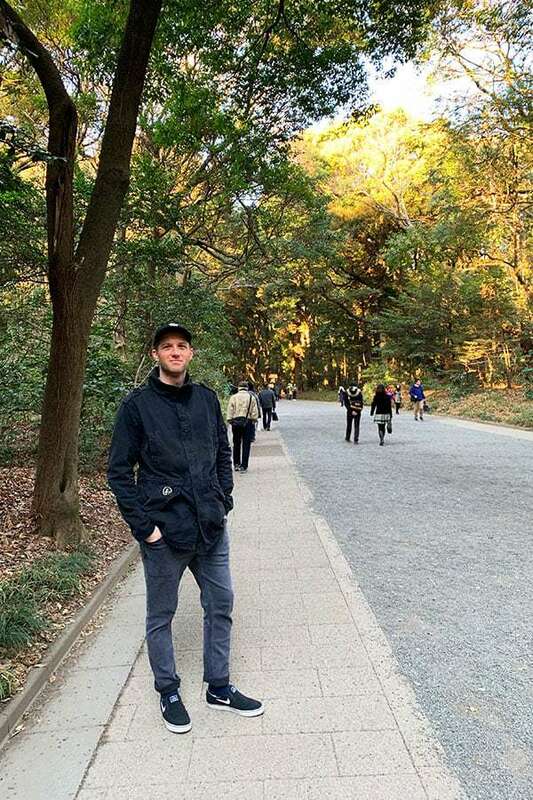 Before we hopped back on the train to our hotel, my husband suggested we take a walk through a nearby park, which turned out to be the Meiji Shrine. I was in awe of the beauty of the tall trees with the sun shining through, it was so peaceful and quiet. We opted not to go into the shrine because of the long line, but we really enjoyed a peaceful moment in the business of the city. We headed back towards to hotel to try and figure out our dinner plan, but again diverted on a whim to head to another nearby destination. 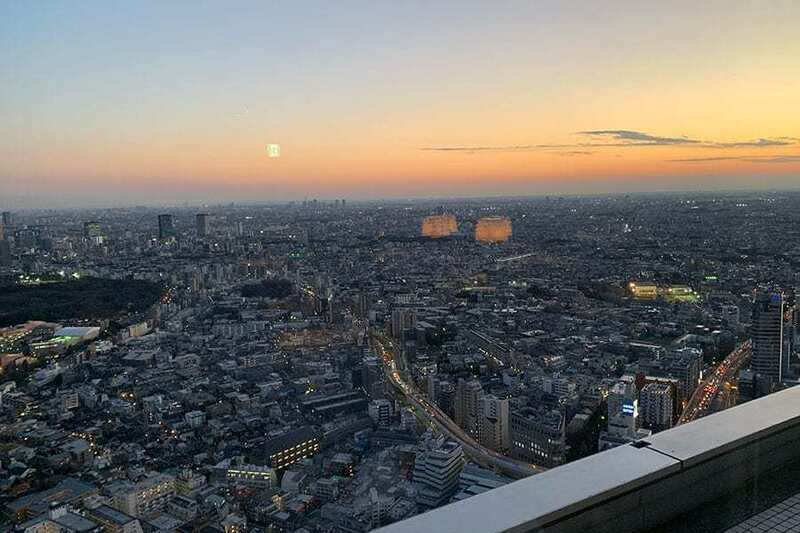 My husband had read about the Park Hyatt’s New York Bar located on the 52nd floor of the hotel. The restaurant and bar offer 360 degrees views of the city. We arrived just before 5pm when they opened and scored a spot next to the window. The views, especially at sunset, were breathtaking and it felt like we could see for miles and miles. It lived up to all the hype. We ordered a few drinks and some appetizers to enjoy. It was one of my favorite things we did during our 48 hours in town, but be prepared to drop a little bit of money on drinks and food, the beers are cheap but that’s about it! Just relax and enjoy to ambience. I can’t imagine there’s anywhere else in the city offering those views! Early the next morning we made the trek to Niseko, so stay tuned for part two! 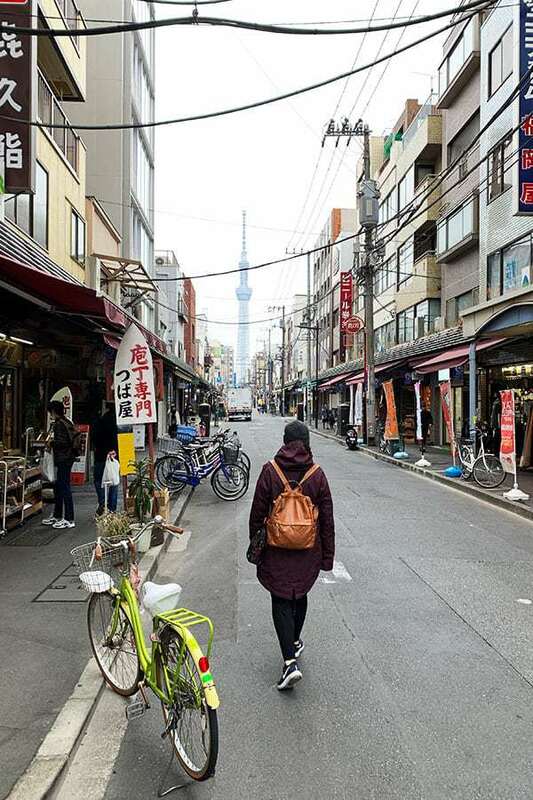 With only 48 hours in Tokyo, we didn’t even begin to scratch the surface of things to do, see and eat there. So I guess we will just have to go back! Thank you for stopping by Faith and for your well wishes! I loved seeing all the pictures from your honeymoon and reading about your adventures! I can’t wait for part two! Congratulations you two and may you have a long, happy wonderful life together.